Charts: Inflation’s Back. Sort Of. 4.88% In November. 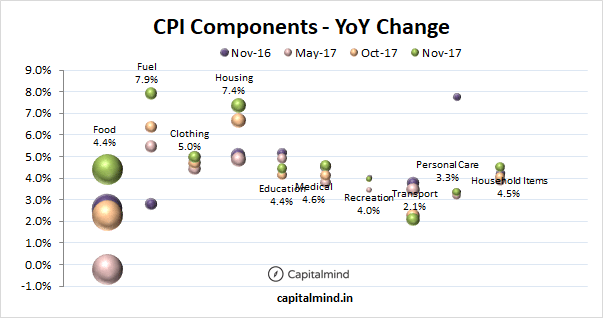 CPI Inflation for the month of November 2017 came in at 4.88%, the highest in 15 months. As you can see there was a bit of a flatline last year and while the base effect exists, the trajectory of inflation remains upward. While food inflation has returned (at 4.4%) we also see that other components like Housing and Fuel have bumped up. And then, it’s not just urban, it’s rural as well. Bonds have lost a lot of steam, with the 10 year bond hitting 7.2%, again the highest in about 15 months. This is effectively a rise in interest rates. Given that many corporates have taken to bond markets to raise funds, bond yields going up means they will have to pay higher rates than earlier. 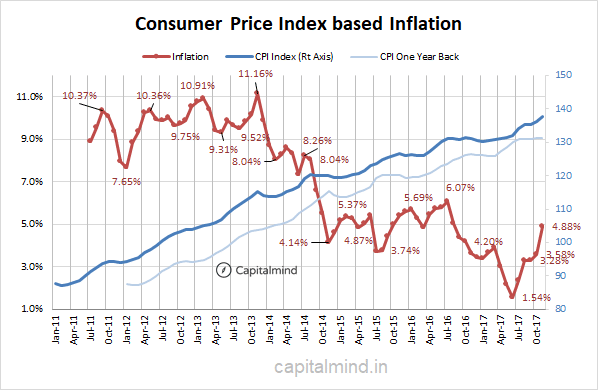 There’s also the fact that a high inflation means RBI might start to take action at some point. It’s unlikely right now, since at 5% figure is not alarming (RBI is mandated to keep inflation between 2% and 6%). Butif it were to go faster towards 6% there will be some action taken. A rise in rates crimps profits and sales, because it is designed to reduce demand. Finally, the rate change will hurt companies that are looking to restructure their loans. Sometimes a company can rework loans by just refinancing at a lower rate. With funds becoming more expensive, the viability of such loan resets will be in question. Meaning: we might just see more defaults if the rates go up with inflation. The good point: it might not last longer than March. 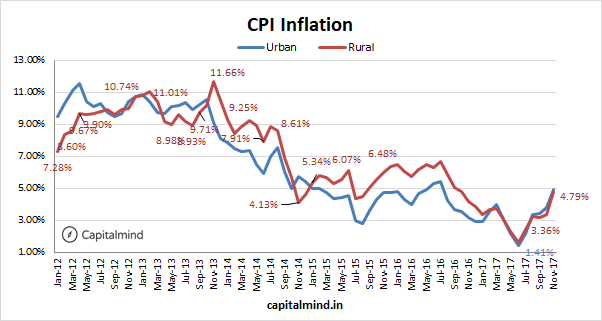 RBI expects inflation to be elevated till March anyhow due to the base effect. Hopefully something else doesn’t come and ruin the story. Watch the Fed, ECB and BOJ meets that are coming through in the next week.